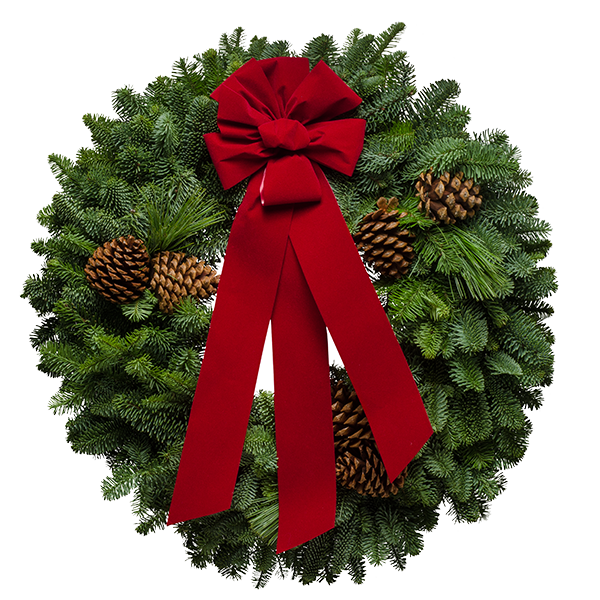 The extra-large Deluxe Christmas Wreaths capture all of the sights and smells of your best Christmas. They represent all that you love about your family's holiday traditions. The Christmas Forest elves blend the pristine aroma of the woodland evergreens and the earthy delight of the Ponderosa pine cones. Then they top off these grand fresh Christmas wreaths with the welcoming warmth of striking red velvet Christmas bows. What a beautiful blend of red and green! These fresh wreaths are timeless classics that display the care and craftsmanship of the Christmas Forest elves. The design is traditional but each wreath is one-of-a-kind. We have customers that love this wreath style so much that they continue to order them for years and years. It will be one of your all time holiday favorites too. You'll be proud to give it to everyone on your gift list. "My Deluxe Christmas Wreath was just delivered and I just wanted to write a note to let you know how beautiful and fragrant it is! I am so impressed with the quality and craftsmanship of it, that your wreaths will become a Christmas tradition at my home for many years to come. Thanks again, and Merry Christmas to you all! ."